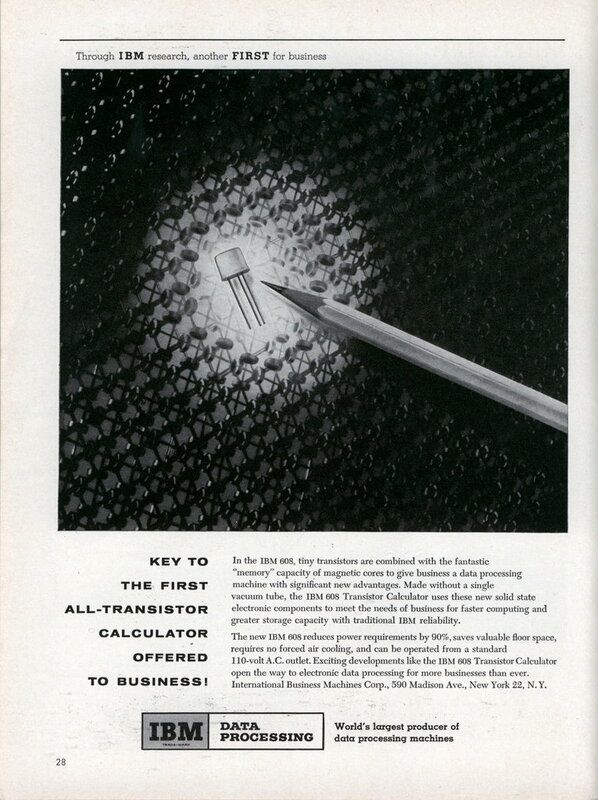 KEY TO THE FIRST ALL-TRANSISTOR CALCULATOR OFFERED TO BUSINESS! In the IBM 608, tiny transistors are combined with the fantastic “memory” capacity of magnetic cores to give business a data processing machine with significant new advantages. Made without a single vacuum tube, the IBM 608 Transistor Calculator uses these new solid state electronic components to meet the needs of business for faster computing and greater storage capacity with traditional IBM reliability. The new IBM 608 reduces power requirements by 90%, saves valuable floor space, requires no forced air cooling, and can be operated from a standard 110-volt A.C. outlet. Exciting developments like the IBM 608 Transistor Calculator open the way to electronic data processing for more businesses than ever. International Business Machines Corp., 590 Madison Ave., New York 22, N. Y.